I have heard of the Southern Cross Quilters on another list because some of my Crazyquilting friends from Down Under are also traditional quilters. It is a great thing they did. I hope your daughter is doing well and does not have a lot of scarring. I am a nurse so I am very familiar with burn treatment. By the way, here in America they teach the kids to Stop, Drop and Roll... very similar. Thanks for sharing! It sounds like you have a very independent daughter with a strong will. Thank you for sharing this story. I'm also glad there was support for you since you are located so far away and probably couldn't directly help in the ways you would have wanted to. I hope your daughter is recovering well. I am so glad your daughter is recovering well. 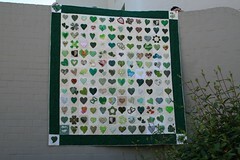 The quilt is beautiful with such wonderful shades of green in the hearts, and a truly super idea for someone to aid their recovery In a world where there is currently so much hate and destruction it's nice that people show such care for those they know and don't know.